We can even help you design a bespoke presentation box for an added touch of luxury and esteem. Our design studio team are experts in turning logos into beautiful pieces of custom-made jewellery. They will work with you from start to finish, ensuring that your corporate cufflinks represent the quality of your organisation to the highest possible standards. They’ll even produce visual concepts, free of charge, to show you how the finished cufflinks will look. Many of our customers order cufflinks to complement badges and keyrings to create stunning gift sets that recipients will treasure and use for years to come. 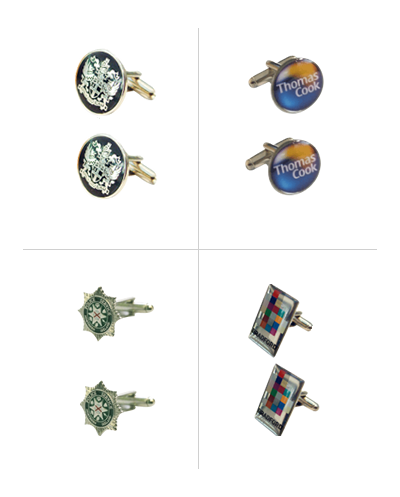 For more information about our custom cufflinks or for help choosing the perfect promotional product for your needs and budget, fill out the quick quote form on this page and we’ll get back to you within two hours (between 9am – 6pm London time). We look forward to speaking with you! 20 Days from the art approval. We want to understand exactly what type of badge you’re looking for, and any other needs you might have. Once we understand your goals, we’ll suggest how we can perfectly design and manufacture your badge – all within budget! We’ll look after all the logistics as we deliver your very own quality-guaranteed custom-made badges!